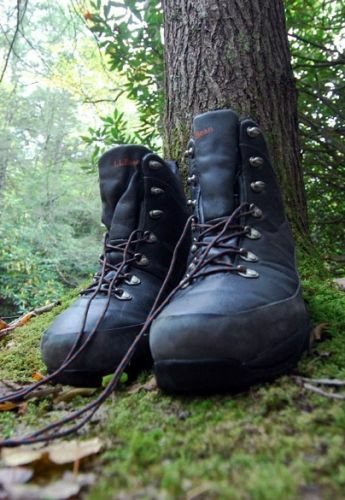 Wading boots and hiking boots serve surprisingly different functions, considering that, after all, they’re both footwear. A good wading boot needs to provide a stable surface underwater, so it often has an extra-wide sole (this is even more true of the new all-rubber models). The wading boot can’t afford a lot of padding (which soaks up water and invasive species), and must be a bit large for the various sizes of neoprene booties which it must accomodate. Meanwhile, a hiking boot should fit you snugly, hug the ankle so you don’t get blisters, and provide plenty of padding. Hiking boots should be waterproof, while with a wading boot that’s irrelevant. Further, hiking boots need deep traction, while wading boots can’t afford huge lugs that trap mud. Finally, hiking boots can be made of lots of natural materials like leather, while wading boots are better off sticking to synthetics. Thus, testing a wading boot out by taking it on a 9-mile, two day hike (about half of it wading upriver), isn’t exactly giving it a fair shake. However, I was pleased to find that the L.L. Bean Gray Ghost boots, new for 2010, held up remarkably well in some really exacting conditions. First and foremost, the new rubber sole works absolutely great, with an important caveat. On a recently-scoured river bottom of small, round boulders, I only fell down once in two days of very strenuous, difficult wading. I fell because I allowed my foot to come down on the edge of the boot rather than on its flat surface: bad idea. Rubber-soled boots don’t have the edge-clinging abilities of squishy felt; if you don’t make solid contact with the rock, you are going to slide–and quickly. On the other hand, testing the boots with a lot of surface-to-surface contact made me feel a lot like Spiderman at times; I could cling to a rock where felt certainly would have slid off. I like the Gray Ghost’s heavy, rubberized upper material, which flexed adequately and certainly provided a lot of protection underwater for the tops of my feet. The entire toe box is trapped in an actual rubber foot bumper, which ought to last for years. The laces are extra strong to allow you to really cinch down the boot. I loved the grommets (especially since I have now blown almost all the grommets out of my old pair). These were extra sturdy and seemed to be made of rustproof stainless steel or heavy duty aluminum. I wear a size 10 in almost everyone else’s wading boots, but the Bean size 10 was a bit large for me. I fixed the problem with an old, unused pair of insoles, which made the boot extra-squishy and comfortable while still giving me plenty of room in the toe box. Even though the terrain I hike has some rugged uphill patches, I avoided blisters on my heels (which I usually don’t even with my old tried-and-true boots). All in all, the Bean Gray Ghosts were exceptionally solid performers that greatly exceeded my expectations, especially with respect to the rubber soles. The jury’s still out on how they’ll perform with any kind of algae coating, but I’m sold on them for plain old rocks. Let us know your thoughts on rubber-soled wading boots in the Comments section!